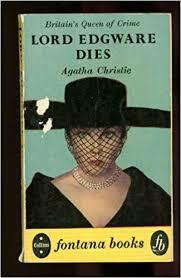 I've just reread Agatha Christie's Lord Edgware Dies, and if you want to avoid spoilers, stop reading now. Written in 1933, it's not one of Christie's best. She'd divorced Archie Christie five years previously, and resolved to be professional about her writing and look on it as a job. She wrote The Mystery of the Blue Train during the split, expanding an earlier short story. She said she never thought much of it, but it is one of my favourites. It features Poirot - but with third-person narration as Hastings is conveniently in "the Argentine". She eventually dropped Hastings, and much as I love the character, and his portrayal by Hugh Fraser, I think she was wise. Without the blinkered Watson-figure, we are far more party to Poirot's thoughts, feelings and most of all impressions - though of course he never gives away his solutions or workings-out. Lord Egware, though it has an intriguing plot to which Hastings is integral, seems somewhat hurried and churned-out. Interesting characters are not developed. And apart from the central premise, one that she returned to again and again, there is one plot-hole: how did the murderer open and reseal the vital letter? Poirot and Hastings are living in "rooms", but these are barely sketched in. Some scenes start like this: We were in our rooms. Suddenly Poirot said "Zut, alors!" and seized his hat and stick. On another occasion a Duchess calls, and they meet her "downstairs". Was this a communal living room? We are not told, and the surroundings are not described. There are moments when Christie's perception and wit put in an appearance, but they are few. Much is made of the latest "soup-plate" hats which are stuck on over one ear, shading one side of the face. And in a typically feminine Christie touch, a lot hinges on what happens if you change clothes and identities – you end up with someone else's handbag. Jenny Driver is an attractive character and we hope she is happy with the man of her choice. As for the other two young lovers, they rather vanish from the story. Apparently nobody can live with Lord Edgware – he has the works of the Marquis de Sade in his bookshelves, and an unnecessariy good-looking butler. We only really get to know the murderer on reading a letter sent to Poirot from the condemned cell. The writer concludes by wondering if they'll end up in Madame Tussauds' waxwork Chamber of Horrors. Christie re-uses a murder method, but never quite explains how the murders were done. But the anti-Semitism... It is 1933. People in British society thought and said such things. Hastings is narrating, so that these remarks come from the other characters, or from from him – and he is known to be not the brightest. It is never Christie speaking. These dated and, to us, unacceptable attitudes are even part of the plot – let me explain. I read a Harper Collins paperback, and have used an etext version for reference. 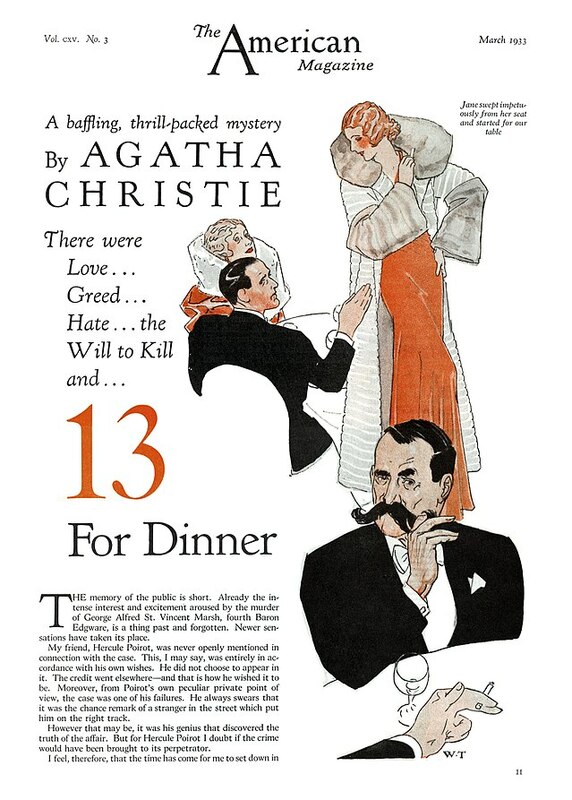 In the paperback version, Hastings and Poirot first set eyes on actress Jane Wilkinson (Lady Edgware) and her imitator, the impressionist Carlotta Adams, in a restaurant. They speculate about the future of the two women. "What do you foretell for Miss Adams?" asks Hastings. Poirot predicts success for the performer. "She is shrewd and she is something more. You observed without doubt that she is a Jewess?" I had not. But now that he mentioned it, I saw the faint traces of Semitic ancestry. Poirot nodded. "It makes for success - that. Though there is still one avenue of danger – since it is of danger that we are talking." "Love of money. Love of money might lead such a one from the prudent and cautious path." "It might do that to all of us." In the etext version any mention of Carlotta's "Semitic ancestry" is dropped and apparently Poirot merely reads "love of money" in the girl's face. This scene is pretty weak, as Poirot diagnoses the characters' "fatal flaws" merely from their appearance. "He’s got an alibi for yesterday evening. He was at the opera with the Dortheimers. Rich Jews. Grosvenor Square." When Captain Marsh tells the story himself he merely says that the Dortheimers are "musical", and hints that their daughter Rachel is a bit solid. Later, when he's talking about how hard-up he was before he came into the title, he says he couldn't face marrying Miss Dortheimer. Her parents like "young men with prospects", and of course he had the prospect of not only coming into money but becoming a Lord. But, he adds, "she’s much too sensible a girl to take me, anyway." On the night in question, Jane Wilkinson was dining with Sir Montague Corner, and there are 12 other guests to give her an alibi. Naturally Poirot goes to interview Sir Montagu. I looked with some interest at Sir Montagu Corner. He had a distinctly Jewish cast of countenance, very small, intelligent black eyes and a carefully arranged toupee. He was a short man — five foot eight at most, 1 should say. His manner was affected to the last degree. He turns out to be a connoisseur of art and antiques, and to be up in the latest modern music and even the theories of Einstein. Hastings thinks he looks like a "medieval genie". A sudden impish fancy flashed over me that, if someone were really to offer Sir Montagu a million pounds, old-world peace might go to the wall, but 1 trod down such heretical sentiments. “What is money, after all?” murmured Mrs Widburn. Another Christie character is given to vapouring that time is infinite - Lady Chevenix-Gore in the long short story Dead Man's Mirror. Sir Montague's love of old-world atmosphere means that his rooms are dimly illuminated by shaded candles after dark. His ability to "do something" for actors he likes is not spelled out – presumably he can invest in a production and interfere in the casting. Or does he just pull strings? I wish we'd seen more of the affected Mrs Widburn. More on the subject here, and links to the rest. Reasons for voting Leave official word cloud: largest is “immigration”, followed by, in rough order of size: “country, sovereignty, control, borders, laws, British, back, independence, money, Brussels, democracy”. All these euphemisms and many more can be found in my book Boo and Hooray!, now expanded and updated to keep pace with the proliferation of weasel words. Aborigines in Australia were “dispersed” – cleared from the land. I’m only saying what everybody’s thinking. I’m proud to be English. I’m the least racist person you’ve ever met! Life was simpler when we were young. The pace of change is too fast: There’s Polish food in Tesco’s and I wasn’t consulted. The English lack a sense of national identity. White men are an endangered species: There’s one woman and one brown person on the board. More here, and links to the rest. So, Was Agatha Christie Anti-Semitic?